mostly old wall clocks. Here is a gallery of some of my current posessions. Feel free to mail me and offer your clock to me, if you want to get rid of it, or try to buy one from my collection :-) My email is oh6nt[at]sral.fi Click on the pictures to enlarge the image or see details. Junghans spring driven "R-A" regulator from 1896. It has a 14 day movt. 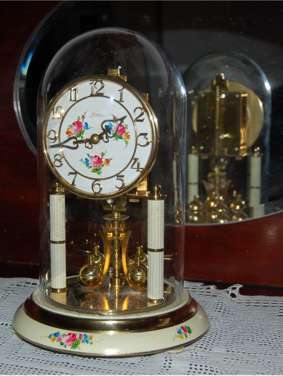 Heritage of my grandfather, this started my obsces-sion for clocks, i.e. this is my "First one". Superb working condition, hanging in my livingroom telling time. NOT for sale! This is a "model 3510" spring driven Gustav Becker wall regulator from about 1932. Golden dial & bob, 8 day movt, P37, strikes every ½ hour on three rods. On the back of the oak cabinet is a red-black-white paper label (click pic to see). Very good condition.SOLD. 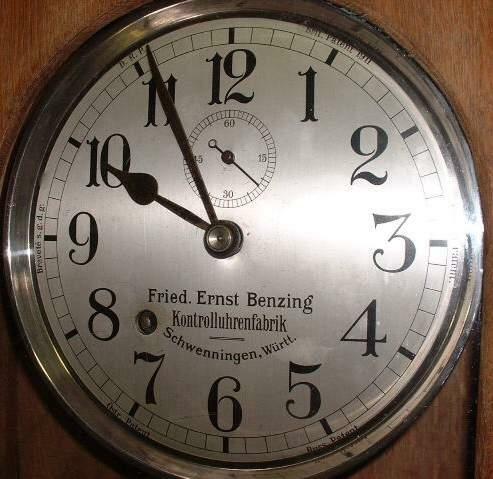 This is a German made freeswinger mansion clock. The movt is by Gustav Becker, Silesia, P42 and newly overhauled. The clock is probably made before 1930. Good working condition and nice sound by a "Gloria" gong. The dial is somewhat worn. Asking 480 €. 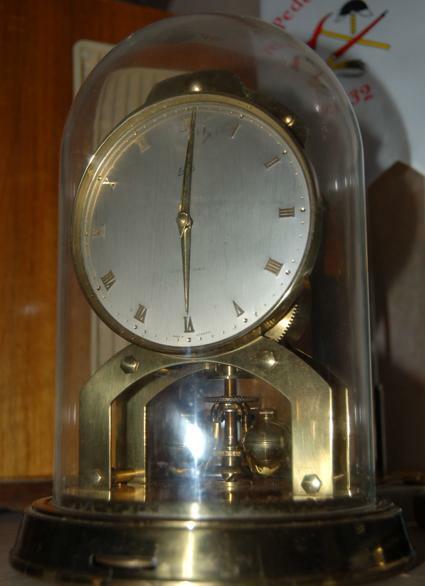 This is a genuine Gustav Becker two-weight Wiener regulator clock made around mid 1886 according to the serial number on the movement (753879). Excellent condition. All parts are original on this clock. Another genuine Gustav Becker two-weight Wiener regulator clock made around 1894 according to the serial number on the movement (1145164). The case is also made by the GB factory according to a stamp behind the case. Excellent condition. All parts of this clock are original. SOLD. Here's my third genuine Gustav Becker wall regulator. The serial # on this one is 1174773 which indicates mfg. year to be around 1895. In excellent condition, no flaws except one small dent on the door lower bar center. The porcelain dial is stamped with GB + anchor as well. All parts are original on this timepiece. This became my fourth Gustav Becker wall regulator. It is a jubilee model with severe embossings on the face, bob, pendule rod and weights. The serial # is 1393099 which gives mfg. year about 1897. In excellent condition. The movt console is not original. Asking 1400 €. 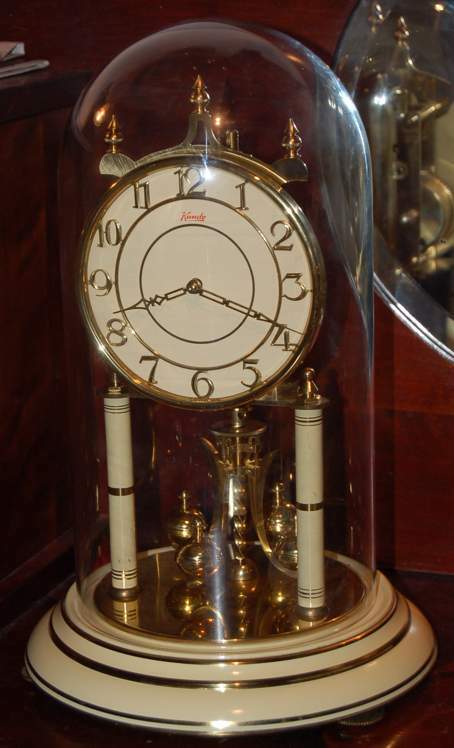 Junghans spring driven wall "R-A" regulator clock from the beginning of 1900. This one has a 7 day spring driven movement. Excellent condition™ . The dial is special with the outer ring beeing beige in colour. Asking 290 €. Ca. 1882 this small wall spring driven regulator was made by Lenzkirch Uhrenfabrik in Baden, Germany (AGUL). The serial number is 522549. 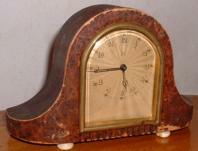 It has a walnut veneered case, temperature compensated R-A pendulum and strikes half and full hours on a spring gong. Full working order. Asking 550 €. 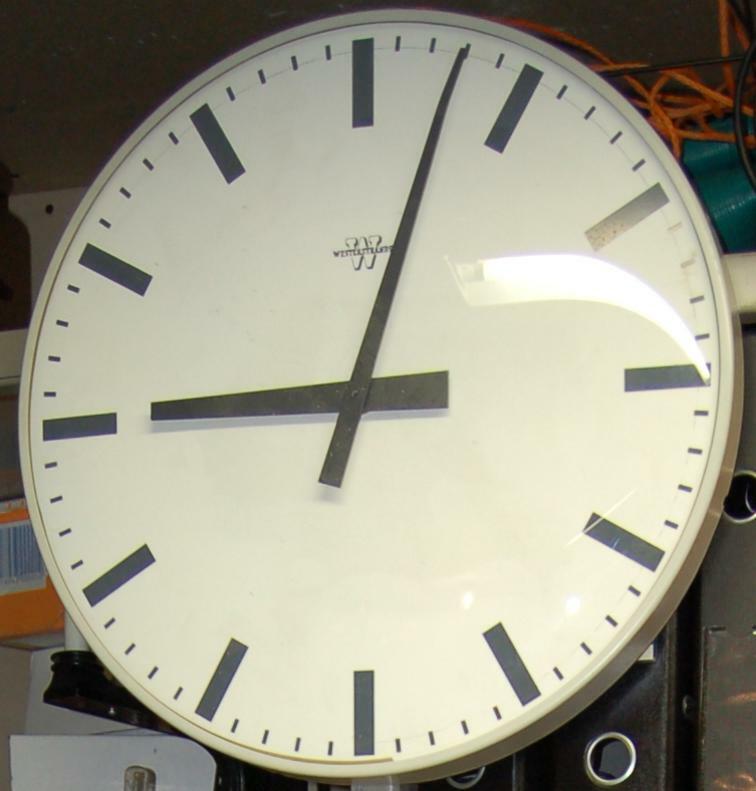 Left is a Junghans miniature spring driven wall "R-A" regulator clock. Age is unkonwn at this time.It has a 3 day spring driven movement. Fair condition. The dial is somewhat worn. SOLD! Yet another Junghans wall regulator from Germany. The 7 day movement has been refurbished so now it is in excellent working condition.The case needs some work, though... The crown and eagle are replacements on this one. Asking 250 €. 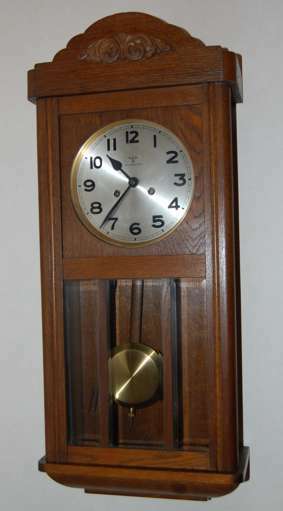 A German oak case wall clock from 1930. Excellent original condition. Made by Friedrich Mauthe, Schwenningen (FMS). Strikes on three rods, half and full hours, very nice sound. Bought at a flea market. Asking 200 €. This Junghans spring driven wall regulator has a very massive case. 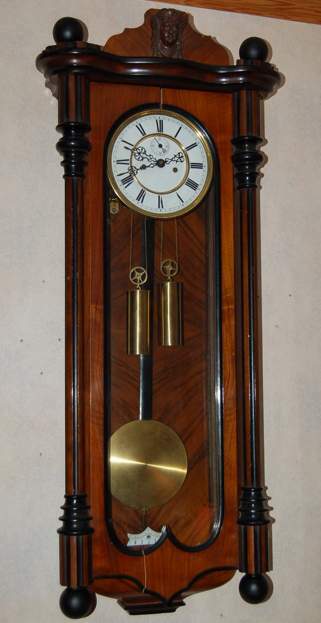 Age is unknown, but the pendulum has a wooden rod, so it is probably from early 1900:s. Good working condition. 7-day movement. The gong sound on this one is very mellow and rich due to the massive cabinet. Asking 350 €. At left is a somewhat newer Gustav Becker / Silesia spring driven wall regulator. 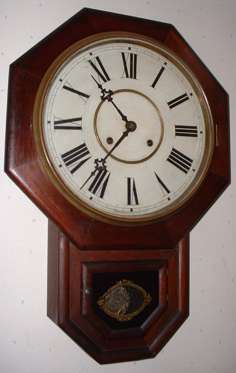 It is a P42 but the pendulum mounted is not original to this clock, it is only 37 cm. The movt needs cleaning, otherwise in working order. The case is slightly worn at the edges. Nice Gloria gong. About 1920? Asking 150 €. My pride is a Hamburg Amerikanische Uhrbau (Pfeilkreutz) hall clock. It's probably from around 1930. The serial number on the back of the cabinet is 5471 35 and on the movement back plate is a serial numer: 20453. It strikes full and half hours on 8 metal rods! Magnificient sound. NOT for sale! This one was sold to me as a Leja - a swedish nickname for Oxenauge or french clocks imported by Joseph Leja in Stockholm. The case is made 1924 i Sweden, and the faceplate is made of alabaster with the numerals in enamel. Lots of irregular pearlshell inlays and golden trimming on the face. An old control clock from Fried. Ernst Benzing. Separate mechanisms for the clock and card punch. Movt in excellent condition, Cabinet (oak) is worn and needs refurbishing. Very heavy! SOLD! 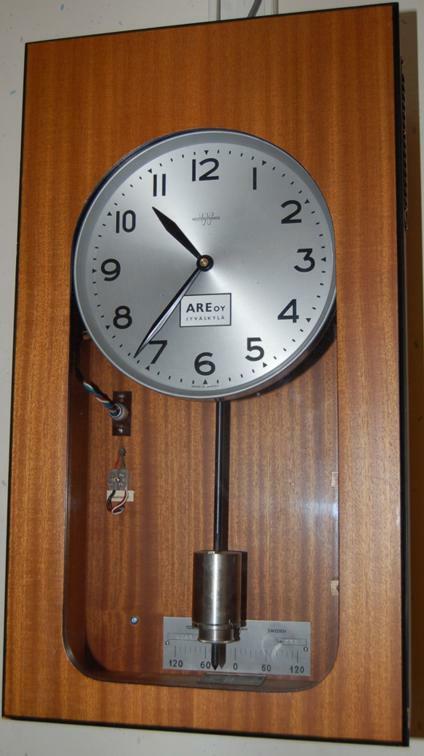 This is an old American 'School Clock' also called 'short drop'. 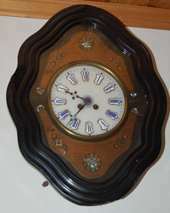 It is made by Watebury Clock co. in Conn. USA. The movement is worn, but in working order. The dial is pretty good for it's age (these are usually very worn). No inidcation of age, but should be in late 1800:s. A gift from a dear HAM-friend of mine. NOT for sale! This is another American 'short drop' also by Waterbury Clock Co. The movt is worn, but working, the dial is very worn but the woodwork is in good shape. 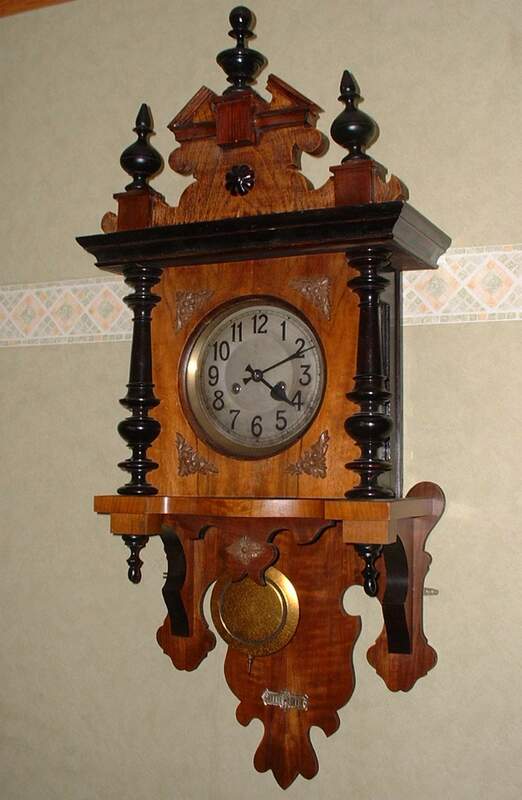 This clock is made around 1875, according to ClockJim on NAWCC. These are also called "chiselbottoms" NOT for sale! 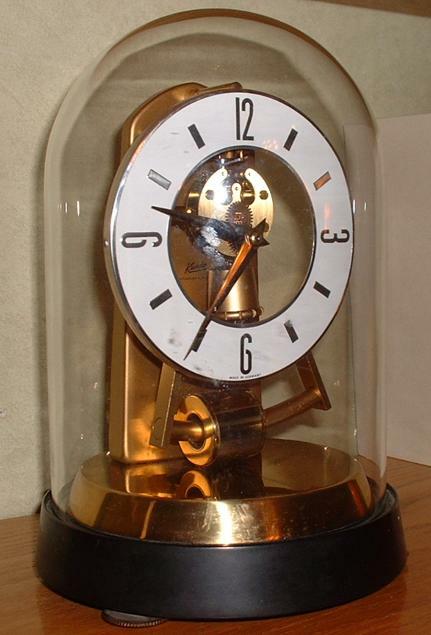 Here is a nice German shelf glass cupole 400-day clock made by Kern & Söhne. Nice condition, new torsion spring keeps this fine timepiece going for the next year or so.... Hand painted flowers on the cream base. Left we have a 1000 day anniversary clock from German clockmaker Anton Schatz. Good condition, but the torsion spring was broken and the dome is not original. New spring is fitted. I do not know much abot this clock yet... At left a German shelf glass cupole "Jahresuhr" from Kundo - Kieninger & Obergfell. 1960's. Mechanical torsion spring movement. In perfect working order. Brass and cream with gold trimmings. Left is a 'Kundo'-clock, an electronic German shelf glass dome clock from Kieninger & Obergfell. About 1960's. Works from a 1,5 V battery. The dome is not circular on this one, rather oval. Here another 'Kundo'-clock, an electronic German shelf glass cupole clock from Kieninger & Obergfell. About 1960's. The glass dome on this one is circular in shape. Fully working. This is NOT a genuine Gustav Becker, I don't know the maker. The case is stamped "German made" on the back. This clock is SOLD! This Swedish cuckoo by Westerstrand is a little special because it is spring driven. Works well, but the cuckoo has a some-what sore throat :-) This is a "Schilduhr" from German Black Forrest. Hand painted front, and wooden frame, even for the mechanism. Works ok. Age probably before WW1. Strikes hourly on a spring, two weights. This is a tiny American shelf clock with one day movement and hourly strike mechanism. 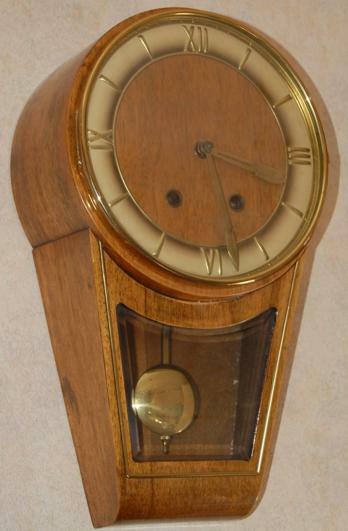 Waterbury Clock Co. "Cottage #2"
An electronic pendulum clock home made by my late father Lars (OH6NZ) in the early 1960's. Works by one germanium transistor and a pair of hand-wound coils + two permanent magnets. Very accurate. 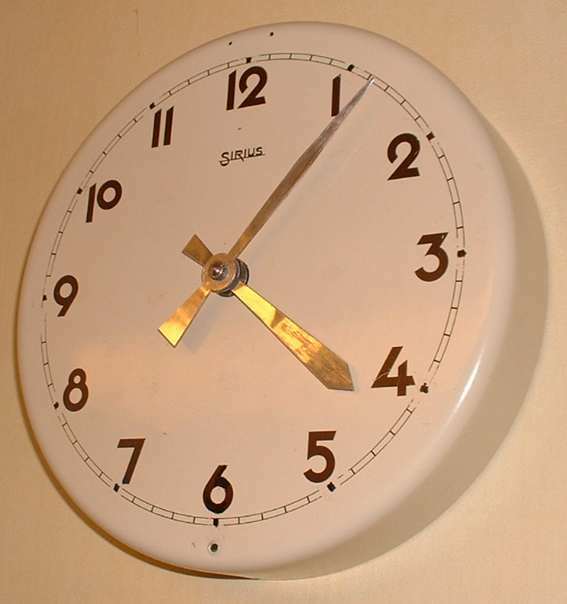 This is a "freeswinger" HAU/HAC wall clock, but the bottom part is not original, it seems to be a part of some furniture door. Look at the woodwork. I wonder what the original look of this clock might be? Going to restore this one myself. A nicely hand crafted wooden pendulum clock from Sweden by Carl Eklöf, Norrköing with Westerstrand movement, probably around 1950's. There is also two lampettes belonging to the set (click pic to see them). 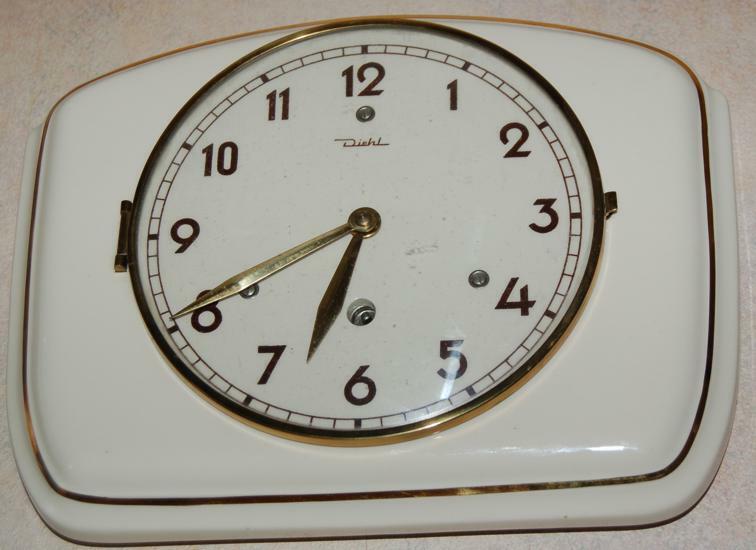 An early battery operated, spring driven kitchen wall clock. Rewinds every 4 minutes with a loud "clonk" sound. This "Sirius" is operated from one flat 4,5 V battery. Swiss made movement. 1950's. My wife has recently expressed some interest in clocks; to the left is a Diehl porcelain kitchen clock she purchased at a collectors' fair. In perfect working order, hangs in our kitchen. 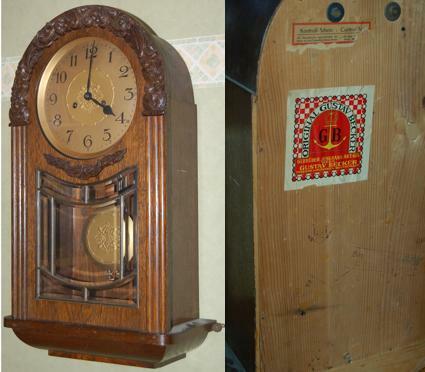 At left we have a German striking wall clock made by Urgos. Year of manufacure is unknown, but 1950's would be a fair guess. The movement has a vertical escape wheel, somewhat unusual. 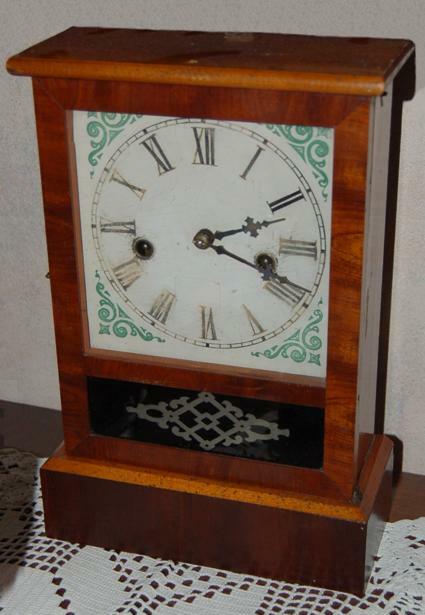 Left is a German table clock by Hermle. Strikes half and full hours on three rods at the bottom of the wooden cabinet. The mechanism is odd; the movement has a vertical escapement I haven't see before. About 1950's. Also see the Urgos wall clock above at right; it has the same mechanism. 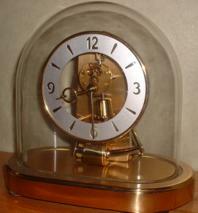 This shelf clock has a Grand Sonnerie" striking mechanism and stirkes every quarter + full hours with very nice sound. 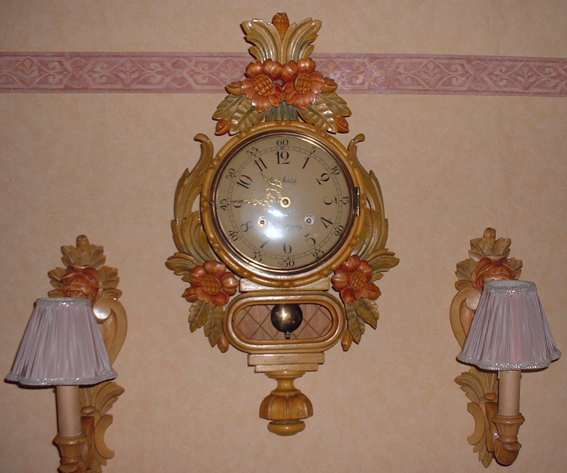 Left is a shelf clock with a escapement that resembles a wecker, but is out back of the rear brass platen. It has a gong with five steel rods I do not know the make of it. 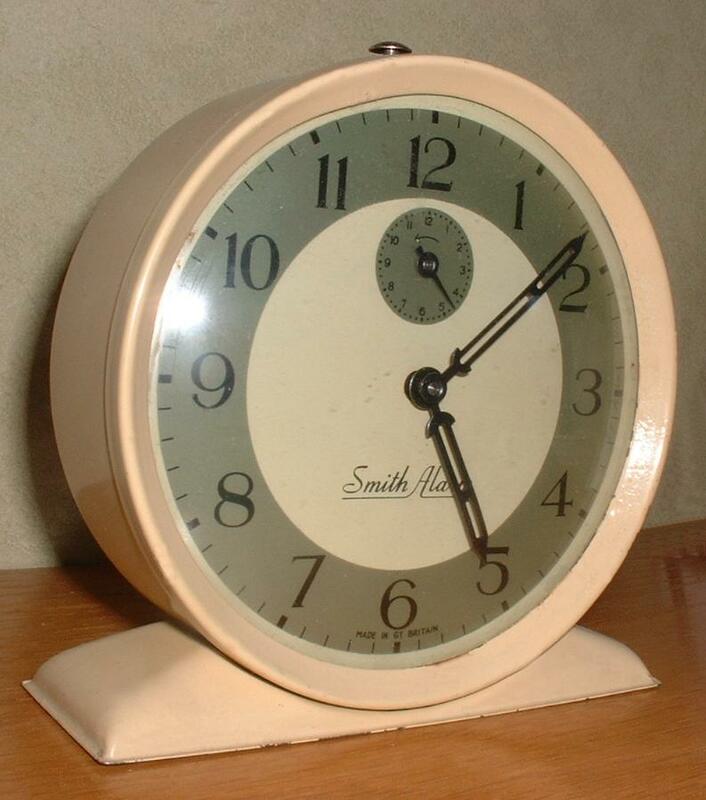 This is a brittish Smith Alarm from 1949 according to a note on the back. The model name of this one is New Dawn. 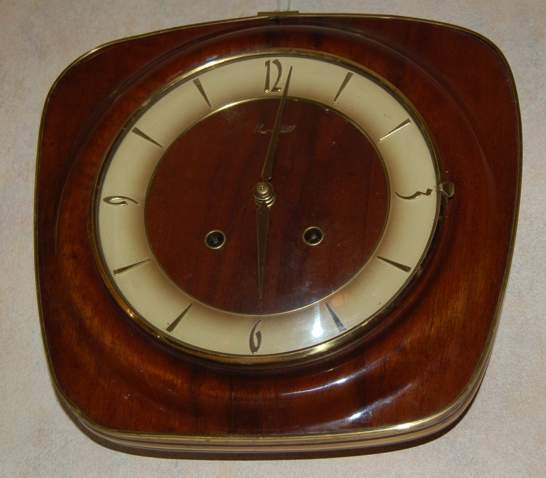 Recently I have become owner of some rare master clocks by the Westerstrand clock factory in Töreboda, Sweden. The leftmost is a HRK with short (½ length) pendulum, and without signalling. The one in the center is a SSHRM with 3/4 length pendulum and double signalling circuits used commonly in Finnish schools from the 60's onwards.The rightmost one is the biggest version, the HRL, with a one second pendulum and no signalling. This type has been common in public buildings. It is shown here with the pendulum in transport position. Click on the pictures for bigger show. All of them are in working condition, but some electronic parts has been exchanged in them, for example the selenium rectifier in the PSU, which has been substituted with a silicone bridge. In addition the pendulum hinge spring on the HRL has to be replaced. The master clock above drives three slaves like the one below in my house! 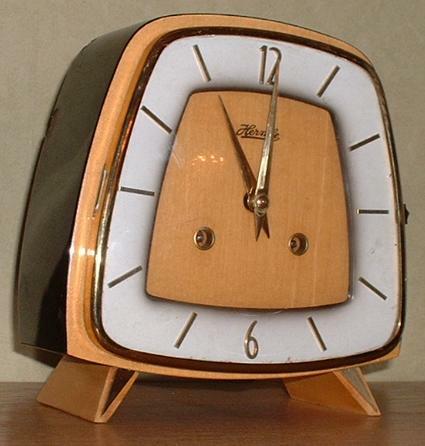 Above a nice little striking wall clock from Hermle. Excellent condition.